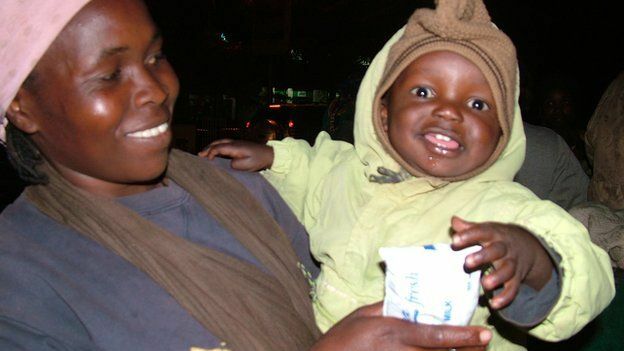 The BBC's Pumza Fihlani spends an evening with Nairobi's good Samaritan, a Kenyan primary school teacher taking his passion for children to unexpected lengths.Its a moving story you must read. Sewerage floods the alleyway; on either side of the narrow passage are aging buildings. The stench of urine fills the air. As we make our way into the night, I begin to make out shadows lining the side of the street. "Odijo, odijo," they shout. Odijo is sheng (Kenyan slang) for teacher - it's an affectionate name they use for the man who has become something of a "messiah" for Nairobi's forgotten children. "Life here is hard. 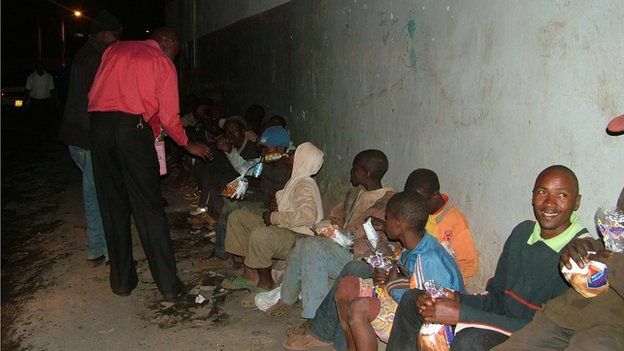 Bad things happen, young boys get beaten up by the older homeless people and we fight for food"
Clifford Oluoch is a primary school teacher in Nairobi by day but has been spending his evenings for the last three months feeding street children. "I was walking home one night and came across boys haggling for a cob of corn. I offered to buy them a cob each, more came, then more. By the end of the night, I had bought corn for 25 people," he says. "They asked if I could come back tomorrow and do the same and I said I would. I've been keeping that promise." 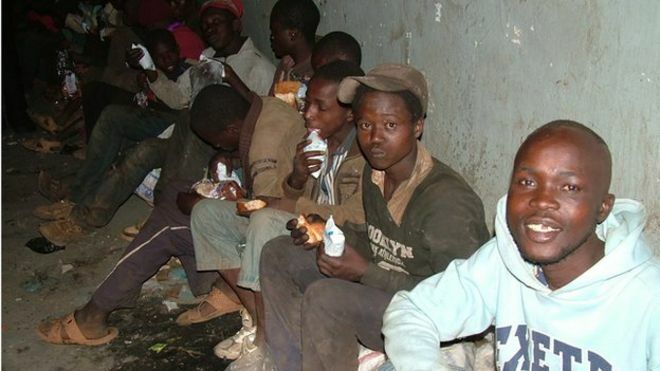 The latest figures are difficult to come by but a 2012 Unicef report estimated that there were 250-300,000 homeless children in Kenya, most of them in the big cities. 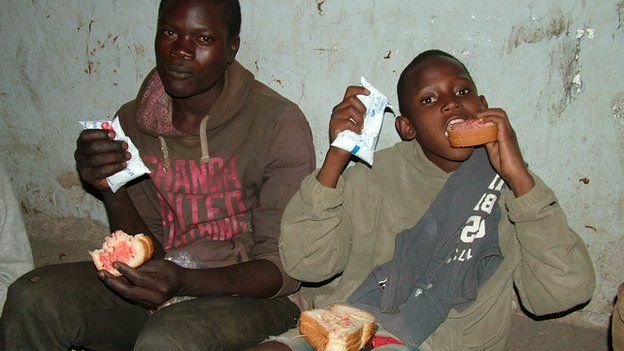 According to Nairobi-based charity Kenya Children of Hope, 63% of the cities' homeless children have been on the streets on a part- or full-time basis for up to five years. In the city centre, the vile smell of human waste, flowing near where we stand, mixes with a thick cloud of industrial glue - a drug of choice here. There is a group of about 20 youngsters waiting crouching on the concrete. Many of them are carrying small plastic containers - a few sniffs of glue can last for several hours. It smells strong and potent. I gesture to it and ask one boy why he uses it. "It makes me warm and makes it easier to sleep at night out here," he says, before drawing three quick pulls from the plastic bottle. I sense he doesn't want to continue with the topic. His name is Thomas, he's 14 and has been living out here for the past four years. Thomas says he has seen many people trying to help but says he thinks "Odijo" is different. Some of the children here are from abusive homes, others left alcoholic parents behind. But the streets are no picnic either. "Life here is hard. Bad things happen, young boys get beaten up by the older homeless people and we fight for food," says one of the boys huddled around me, he too is sniffing glue and his eyes are blood-shot. But they are mostly orderly and welcome me as Odijo's guest. They tell me he is like their "messiah". 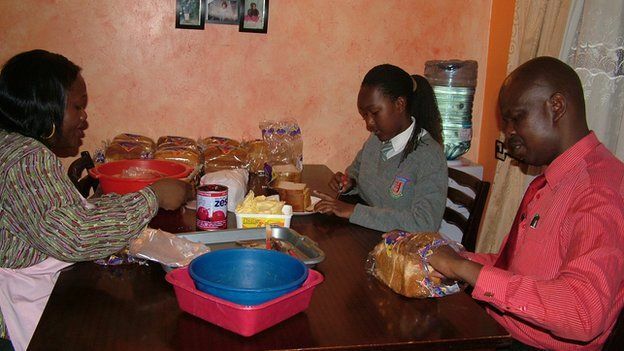 Earlier that evening, the teacher, his wife Benedette and their 13-year old daughter had buttered 30 loaves of bread. This type of meal costs about 2,000 Kenyan shillings ($22; £14) a day. For months he has been splitting his salary between his wife and two children and 60 street children and says he was beginning to feel the pinch. 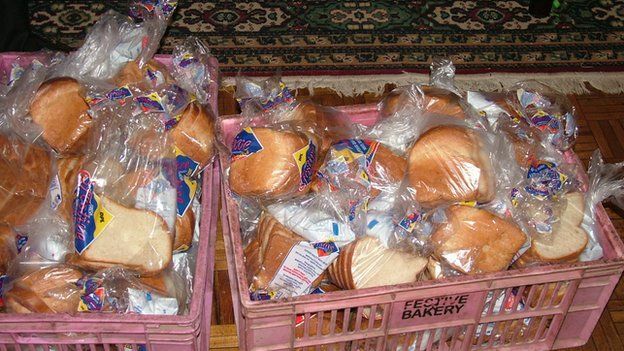 Thankfully word is slowly started to spread in his community - this month he got a donor for bread. He says he can now use that money to see to other needs such as transporting someone to hospital, or helping some of the homeless women set up fruit stalls. Still, this is an expensive project to maintain on a teacher's salary, not to mention the time away from his family - up to three hours every evening. "My wife and I feel strongly about helping other people," he says. "We know what is it to grow up having nothing. We know how difficult life is when you have no-one. This is making a difference, that makes all of it worth it," Benedette told me earlier. It's dark now and he hands out the parcels quickly, desperate to get to the next location - for some this is the first and only meal of the day. What took him and his family an hour to prepare is gobbled down in 10 minutes. Some nights the feeding is followed by a counselling session - this is the most difficult part. "A lot of these children have been disappointed so many times and that's made some of them hard. I've learned that they are just hungry for love - for someone who will care about them," he says, as if drowning under the weight of this task. The children have a lot of faith in him - he tells me they make him feel superhuman, like he can solve all their problems. He, of course, knows he can't. He has big plans to help get them off the streets - but with no-one else to help, that's a long way off. We take a short drive. 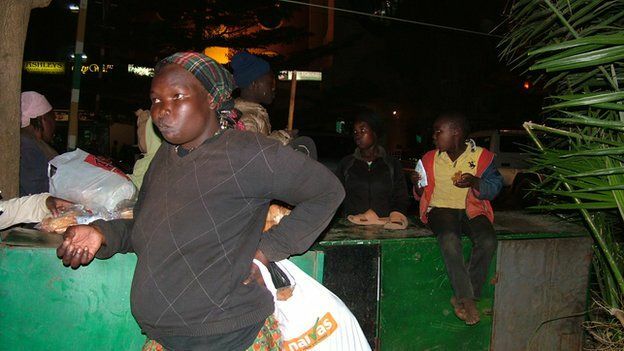 A group of mothers is huddled under a flickering streetlight near a shopping centre in the affluent Westlands district. It's a busy area with fast-food restaurants. It smells of roasted garlic and warm curry - torture, even for me. As Clifford makes his way to them, a crowd of children no more than three years old runs to him, tugging at the plastic bags in his hands. Another feeding frenzy. "This is no place for children. I'm hoping to get the youngsters out while they still have a chance," he says. One of the women tells me says she's been homeless for seven years and has no skills to speak of. Her son, Wesley, just a year old, has a cold, so we walk to a nearby pharmacy where Clifford buys him medication. The contrast of the woman and baby in their grubby clothes and the health worker in his crisp white coats is stark. "They know I don't give them money. I don't encourage people to give them money either but if I can help with things like buying medicine then I do," explains Clifford as we walk out. By this point the woman and her boy have disappeared back into the night. Clifford has learned that the streets are addictive and that some people cannot leave - some do not even want to. This is all they know. Being a Good Samaritan can be a thankless task as some sell the clothes he collects for them to buy drugs or alcohol. But some - although few - still dream of a different life. "I left school after my father died and my mother couldn't afford to take me to school, I thought it was easier to go out and take care of myself," says 13-year old Neville, who adds he wants to be a reporter. "I want to go back to school one day. I'm hoping Odijo can help with that. I don't want to live here for the rest of my life." Hearing this fills Clifford with hope and the drive to keep going. "If I can save just one person, just one child, that would be enough for me," he says. And so he keeps coming back, night after night with nothing more than buttered bread and a heart ready to love - and they are grateful. How can we reduce the plaque of broken homes? Should corporate organizations and governments have specific budgets for clear problems like this? You are doing very good jog, keep it up and tell them to play this game clash royale mod apk latest version .